Bravura is pleased to be working with The Suffolk Theater. The newly restored art deco theater boasts high standards of classic, vintage style. 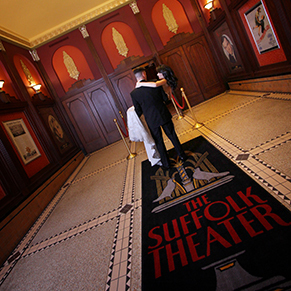 Join us this Sunday, January 25th from 12PM to 4PM at “The Suffolk Theater Wedding Showcase”. Bravura’s creative director, Tony Del Corvo and his team of entertainment specialists will be sharing their ideas on how to bring your wedding celebration to this historical stage! Free admission with pre-registration or $10 @ the door.